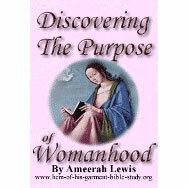 Could you please send them your ebook on womanhood? Thankyou. What does one need to do in order to receive this e-book? I'd love to get it if I could. I'm sorry you have been unable to send your sisters a copy of the ebook. Unfortunately, due to Anti-SPAM laws, I can not legally email them because they have not personally asked me to contact them. But, I do have another idea. If you send them an email with the link, all they have to do is click on the link and they will be able to download the book just like you did.